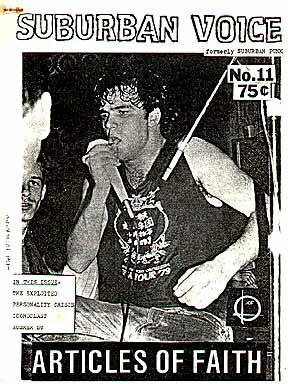 With this issue, Suburban Punk became Suburban Voice, but the numbering sequence continued undisturbed. 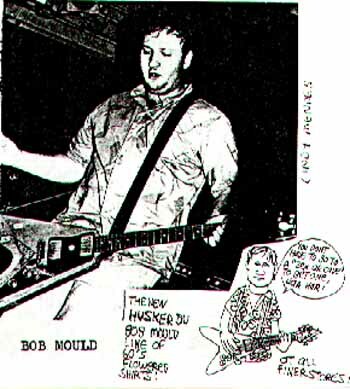 Issue #11 (who made the rule that prohibited fanzines from using the "Volume X, No. Y" method of enumeration?) 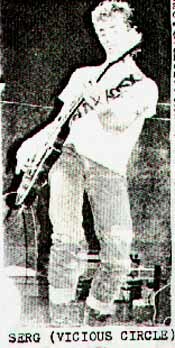 finds publisher Al Quint recounting his three successive nights of Hüsker-chasing in Jun 1984. In the same issue was a review of the "Eight Miles High" single. Rhode Island has to offer. some beat up jalopy in Revere. faves like "It's Not Funny,"
ing to be on the new album. esting, and I do like Michael Cudahy's quirky stage presence. It was request night for Husker and they did "In A Free Land,"
put in a half-decent set. sonality Crisis from Canada opened and were really good. picked up steam quickly and, by set's end, they were smokin'! of Articles Of Faith, but they sounded good from the outside. at work and permanent circles under my eyes- you know it!! * "Something I Learned Today."